Exfoliating is a critical step in skin lightening and brightening because as we age the natural process of cell turnover slows down leaving skin duller, drier and less smooth. Deep Exfoliation Mask exfoliates the dead layers of the skin for faster cell turnover, reduces pigmentation, particularly useful for darker skinned patients with pigmented acne scars and melasma (pregnancy mask). 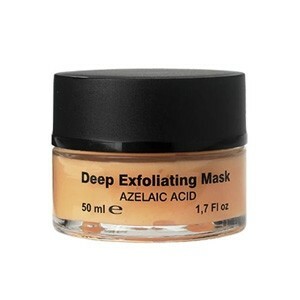 Azelaic Acid + Glycolic Acid + Lactic Acid: Exfoliates the dea layers of the skin for faster cell turnover. Reduces sensitivity and redness. Azelaic Acid: Helps to reduce pigmenation, particularly useful fro darker skinned patients with pigmented acne scars and amlasma (pregrnacy marks). Aqua/Water/Eau, Lactic Acid, Lysine, Cetearyl Alcohol, Glycerin, Sodium Acrylate/ Sodium Acryloyldimethyltaurate Copolymer, Butylene Glycol, Peg-40 Stearate, Isohexadecane, Sodium Hydroxide, Polysorbate 80, Azelaic Acid, Silanediol Salicylate, Peg-20 Stearate, Phenoxyethanol, Carbomer, Polysorbate 20, Chlorphenesin, Methylparaben, Cetyl Acetate, Benzoic Acid, Parfum (Fragrance), Oleyl Acetate, Stearyl Acetate, Ci 19140 (Yellow 5), Magnesium Nitrate, Acetylated Lanolin Alcohol, Ci 14700 (Red4), Sodium Methylparaben, Methylchloroisothiazolinone, Magnesium Chloride, Propylparaben, Methylisothiazolinone, Palmitoyl Pentapeptide-3.